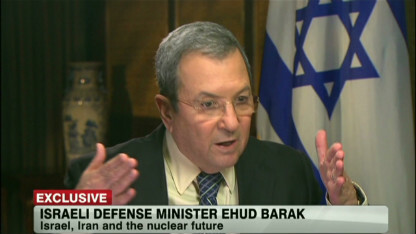 In a new interview with Christiane Amanpour, Israeli Foreign Minister Ehud Barak addressed questions about Iran's nuclear program and a potential Israeli attack on Iran by rehashing long-debunked propaganda and outright lies. Beyond the sheer absurdity of a government official of a state that refuses to sign the NPT and has an undeclared, unmonitored, and un-inspected arsenal of hundreds of nuclear weapons dictating terms to an NPT member state with a non-militarized nuclear enrichment program fully under international safeguards, some of Barak's claims simply echoed last week's widely-criticized New York Times article by James Risen. Following the recent emphasis on Iranian Rahbar Sayyid Ali Khamenei's fatwa against nuclear weapons, Risen's piece claims that public statements by the Iranian leader should not be taken seriously based upon both comments he made regarding Moammar Qaddafi's voluntary dismantling of Libya's nascent nuclear program and what Risen terms the "Shiite historical concept called taqiyya, or religious dissembling. For centuries an oppressed minority within Islam, Shiites learned to conceal their sectarian identity to survive, and so there is a precedent for lying to protect the Shiite community." Many analysts have already addressed Risen's (and his unnamed sources) clear misunderstanding or disingenuous definition of taqiyya, or religious dissimulation, which is not Shi'a-sanctioned lying at all but rather a dispensation for Shi'a Muslims to conceal their particular faith in the face of immediate and imminent danger, threat, oppression or compulsion as a means of individual survival. The concept derives from the historical persecution of Shiites in majority Sunni communities and is aimed at protecting adherents from physical danger or property appropriation. Additionally, taqiyya may only be employed if such concealment of faith - not the permission to just lie about anything - does not result in causing injustice to anyone else. "Have you heard the term taqiyya, which means in Islam, especially the Shi'a, a kind of permission, from heaven, to the leader to lie [and] mislead partners as long as it's needed in order to reach the objective, the political objectives of the movement, the group or the tribe or the clam or the nation. So, I don't buy it." Barak's repetition of these falsehoods puts him squarely in the company of some of the most ardent Islamophobes and apologists for Israel, and who are - unsurprisingly - also those pushing hardest for an illegal military assault on Iran. They are products of a culture in which to tell a lie…creates no dissonance. They don't suffer from the problem of telling lies that exists in Judeo-Christian culture. Truth is seen as an irrelevant category. There is only that which serves your purpose and that which doesn't. They see themselves as emissaries of a national movement for whom everything is permissible. There is no such thing as "the truth." Furthermore, Barak reveals himself to be completely ignorant both about the concept of taqiyya (his definition is so wrong and self-serving as to be not only laughable, but irrelevant) and about the particulars of Shi'a doctrine and Iranian politics as established by the founding fathers of the Islamic Republic. The exact extent of danger which would make permissible the practice of Taqiyya has been debated among different Shi'a scholars. In our view point, the practice of Taqiyya is permitted if there is definite danger facing one's own life or the life of one's family, or the possibility of the loss of the honor and virtue of one's wife or of other female members of the family, or the danger of the loss of one's material belongings to such an extent as to cause complete destitution and prevent a man from being able to continue to support himself and his family. The Imams, may peace be upon them, imposed on the jurisprudence very important ordinances and committed them to shouldering and preserving the trust. It is not right to resort to dissimulation on every issue, small and big. Dissimulation was legislated to preserve one's life or others from damage on subsidiary issues of the laws. But if Islam in its entirety is in danger, then there is no place for dissimulation and for silence. The claim that taqiyya permits (or even encourages) religious Muslims to lie for any reason whatsoever is simply not true - but its misinterpretation does reveal the Islamophobic tendencies of those who promote such falsehoods as a way to discount and discredit diplomacy on their way to war.